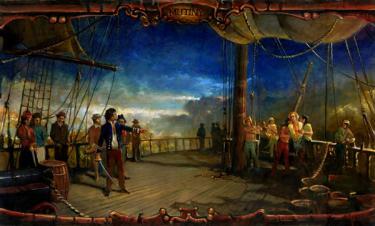 The Mutiny on the Bounty was a mutiny aboard the British Royal Navy ship HMS Bounty on 28 April 1789. The mutiny was led by Master’s Mate and Acting Lieutenant Fletcher Christian against their captain, Lieutenant William Bligh. Even today scholars still dispute the causes of the mutiny. Some hold that it was Bligh’s exceptionally harsh treatment of the men that led to the revolt, while others suggest that the men were unable to adjust to the rigors of naval life following their idyllic five-month stint on Tahiti. I have come to the conclusion after reading many of the documents of the era, and following Bligh’s subsequent career, that it was a combination of the two. Bligh was a petty, cruel man, but there were many like him in the Royal Navy who did not have to deal with mutiny. The Bounty crew might have lived with his tyranny were it not for their sojourn on Tahiti which showed them the alternative to vile food, cramped shipboard conditions, rats, and the cat o’ nine tails. Nor should it be forgotten that Christian was a headstrong man with a talent for leadership. What is beyond dispute is that Bligh, despite his flaws was a superb seaman. When he was set adrift with eighteen loyal seamen in a23-foot (7 m) open launch, equipped only with a quadrant and pocket watch and without charts or compass, he navigated them on a 47-day voyage to Timor in the Dutch East Indies. He recorded the distance as 3,618 nautical miles (6,701 km; 4,164 mi). 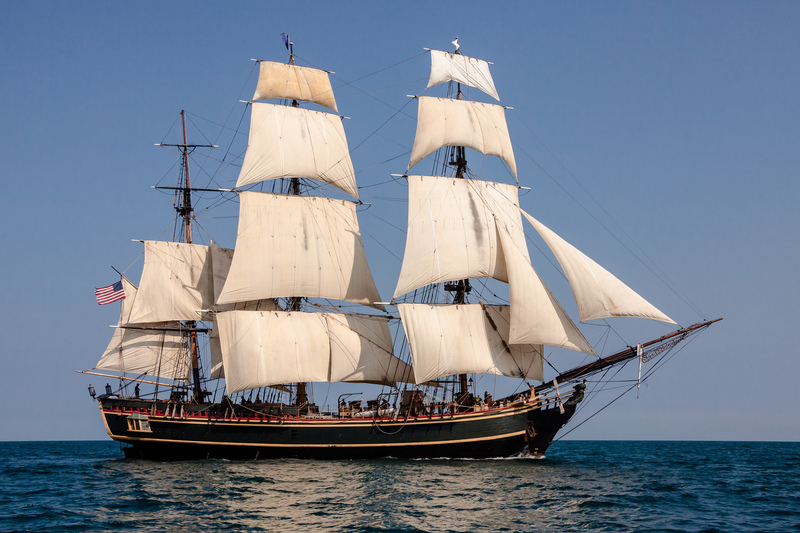 HMS Bounty began her career as the collier Bethia, a small vessel built in 1784 at the Blaydes shipyard in Hull. On 26 May 1787 she was bought by the Royal Navy for £2,600, refitted, and renamed Bounty. Bligh was appointed commanding lieutenant of Bounty on 16 August 1787, at the age of 32, after a career that included a tour as sailing master of James Cook’s HMS Resolution during Cook’s third and final voyage (1776–79). 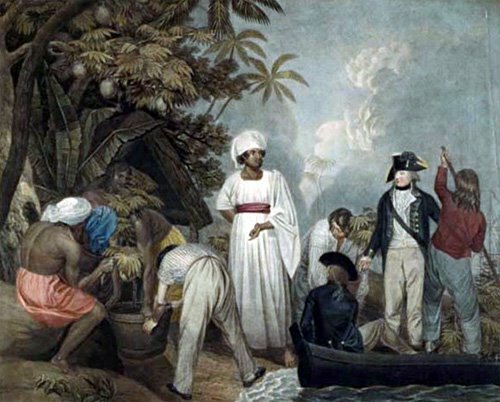 The Royal Navy bought the ship for a single mission in support of an experiment: she was to travel to Tahiti, pick up breadfruit plants, and transport them to the West Indies, in the hope that they would grow well there and become a cheap source of food for slaves. The experiment, promoted through a prize offered by the Royal Society, was proposed by Sir Joseph Banks (Cook’s botanist), who recommended Bligh as commander, Banks at the time being the unofficial director of Kew Gardens. In June 1787, Bounty was refitted at Deptford. The captain’s cabin was converted to house the potted breadfruit plants, and glazed windows were fitted to the upper deck, while a lead lining was installed on the deck to catch and re-use run-off to water the plants. Bligh was quartered in a small cramped cabin next to crew and officers. On 23 December 1787, Bounty sailed from Spithead for Tahiti with a crew of 46 officers and men. For a full month, she attempted to round Cape Horn, but adverse weather blocked her. Bligh ordered her turned about, and proceeded east, rounding the Cape of Good Hope and crossing the width of the Indian Ocean. During the outward voyage, Bligh demoted the ship’s sailing master, John Fryer, replacing him with Fletcher Christian. This act seriously damaged the relationship between Bligh and Fryer, and Fryer would later claim Bligh’s act was entirely personal. Bounty reached Tahiti on 26 October 1788, after ten months at sea. Bligh and his crew spent five months in Tahiti, then known as “Otaheite,” collecting and preparing a total of 1,015 breadfruit plants. This layover was unplanned, but was required to allow the plants to reach the point of development where they could be safely transported by ship. Bligh allowed the crew to live ashore and care for the potted breadfruit plants where they became socialized to the customs and culture of the Tahitians. Many of the seamen and some of the “young gentlemen” (boys of high birth destined as officers) had themselves tattooed in native fashion. Master’s Mate and Acting Lieutenant Fletcher Christian married Maimiti, a Tahitian woman. Other warrant officers and seamen of the Bounty were also said to have formed “connections” with native women. The women are handsome … and have sufficient delicacy to make them admired and beloved – The chiefs have taken such a liking to our people that they have rather encouraged their stay among them than otherwise, and even made promises of large possessions. Under these and many other attendant circumstances equally desirable it is therefore now not to be wondered at … that a set of sailors led by officers and void of connections … should be governed by such powerful inducement … to fix themselves in the midst of plenty in the finest island in the world where they need not labour, and where the allurements of dissipation are more than equal to anything that can be conceived. Despite the relaxed atmosphere, relations between Bligh and his men, and particularly between Bligh and Christian, deteriorated whilst in Tahiti. Christian was routinely humiliated by the captain—often in front of the crew and the native Tahitians—for real or imagined slackness, while severe punishments were handed out to men whose carelessness had led to the loss or theft of equipment. 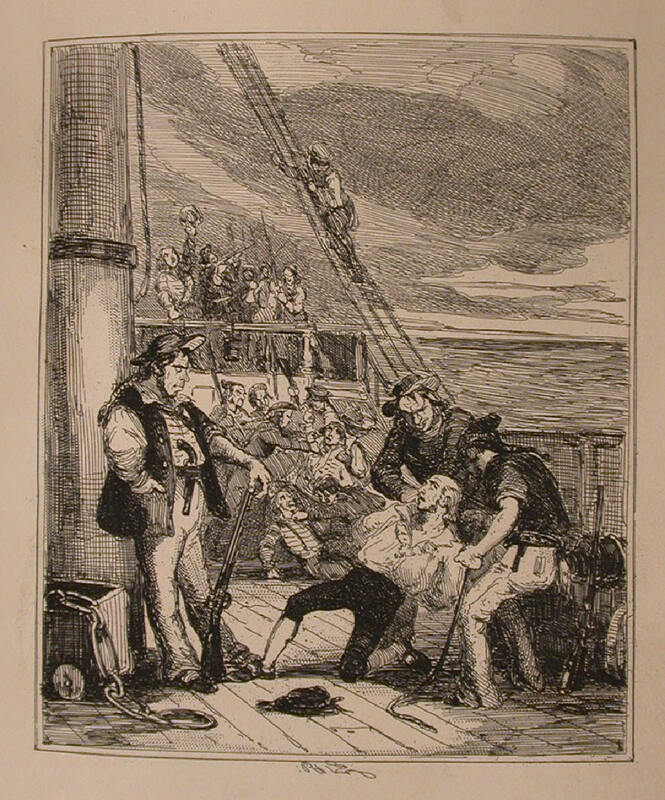 Floggings, rarely administered during the outward voyage, now became a common occurrence. As a consequence, crewmen Millward, Muspratt, and Churchill deserted the ship. They were quickly recaptured, and a search of their belongings revealed a list of names which included those of Christian and Peter Heywood. Bligh confronted the pair and accused them of complicity in the desertion plot, which they strenuously denied. Without further corroboration, Bligh could not act against them. As the date for departure grew closer, Bligh’s outbursts against his officers became more frequent. One witness reported: “Whatever fault was found, Mr. Christian was sure to bear the brunt.” Tensions rose among the men, who faced the prospect of a long and dangerous voyage that would take them through the uncharted Endeavour Strait, followed by many months of hard sailing. But Bligh was impatient to be away. On 5 April, Bounty finally weighed anchor and made for the open sea with its breadfruit cargo. The mutiny occurred on 28 April 1789, 23 days out and 1,300 miles west of Tahiti. Fletcher Christian had that morning contemplated making a raft and deserting the ship by paddling around 30 nautical miles (56 km/35 mi) to the nearby island of Tofua. Instead he and several of his followers entered Bligh’s cabin, which he always left unlocked. They awakened Bligh and pushed him on deck wearing only his nightshirt, where he was guarded by Christian holding a bayonet. When Bligh entreated Christian to be reasonable, Christian would only reply, “I am in hell, I am in hell!” Despite strong words and threats on both sides, the ship was taken bloodlessly and apparently without struggle by any of the loyalists except Bligh himself. Of the 42 men on board aside from Bligh and Christian, 18 joined the mutiny, two were passive, and 22 remained loyal to Bligh. The mutineers ordered Bligh, the ship’s master, two midshipmen, the surgeon’s mate, and the ship’s clerk into Bounty’s launch. Several more men voluntarily joined Bligh rather than remaining aboard, as they knew that those who remained on board would be considered de jure mutineers under the Articles of War, and, thus, could be hanged. In all, 18 of the loyal crew were in the launch with Bligh; 4 other loyalists were forced to stay with the 18 mutineers and 2 passive crew. Bligh and his crew headed for Tofua (in a bay that they subsequently called “Murderers’ Cove”) to augment their meager provisions. The only casualty during this voyage was a crewman, John Norton, who was stoned to death by some locals of Tofua. Bligh then navigated the 23-foot (7 m) open launch on a 47-day voyage to Timor. Equipped with a quadrant and a pocket watch and with no charts or compass, he recorded the distance as 3,618 nautical miles (6,701 km; 4,164 mi). He was chased by locals in what is now known as Bligh Water in Fiji, and passed through the Torres Strait along the way, landing in Kupang, Timor, on 14 June. Shortly after the launch reached Timor, the cook and botanist died. Three other crewmen died in the coming months. Bligh returned to Britain and reported the mutiny to the Admiralty on 15 March 1790, 2 years and 11 weeks after leaving England. Meanwhile, the mutineers sailed for the island of Tubuai, where they tried to settle. After three months of being attacked by the island’s locals they returned to Tahiti. Twelve of the mutineers and the four loyalists who had been unable to accompany Bligh remained there, taking their chances that the Royal Navy would not find them and bring them to justice. Two of the mutineers died in Tahiti between 1789 and 1790. Matthew Thompson shot Charles Churchill and was subsequently stoned to death by Churchill’s Tahitian family in an act of vendetta. HMS Pandora, under the command of Captain Edward Edwards, was dispatched on 7 November 1790 to search for Bounty and the mutineers. Pandora carried twice the normal number of master’s mates, petty officers, and midshipmen, as it was expected that the extras would man Bounty when she was recovered from the mutineers. Pandora reached Tahiti on 23 March 1791. Four of the men from Bounty came on board Pandora soon after her arrival, and ten more were arrested within a few weeks. 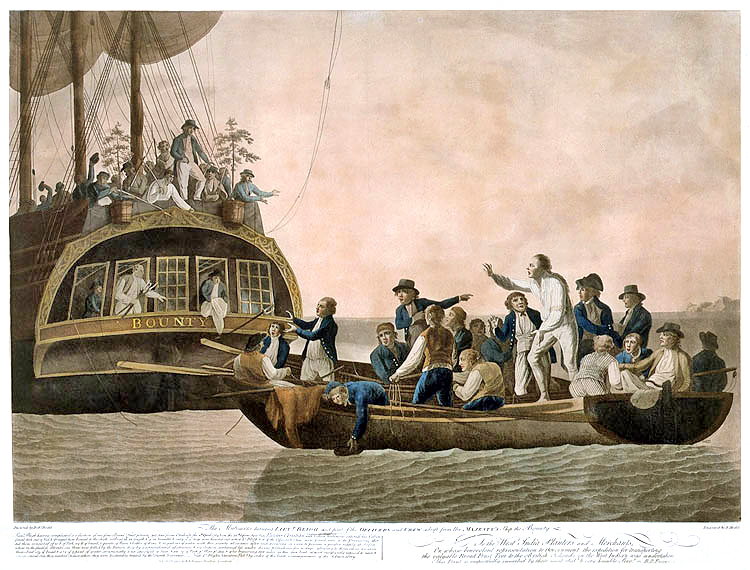 These fourteen, mutineers and loyal crew alike, were imprisoned in a makeshift cell on Pandora’s deck, which they derisively called “Pandora’s Box.” On 8 May 1791, Pandora left Tahiti, spending about three months visiting islands to the west of Tahiti in search of Bounty and the remaining mutineers, without finding anything except flotsam (including some spars and a yard on Palmerston Island). 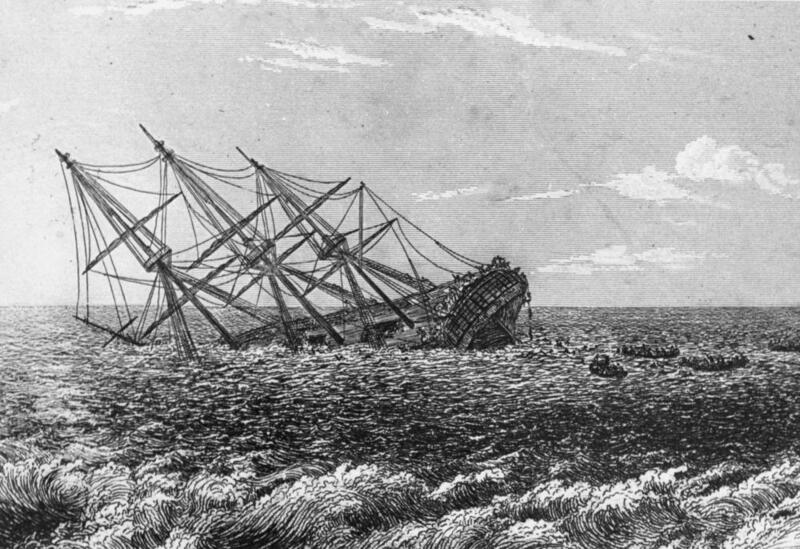 Heading west through the Torres Strait, Pandora ran aground on a reef (part of the Great Barrier Reef) on 29 August 1791. The ship sank the next morning, and 31 of the crew and four of the prisoners (Skinner, Sumner, Stewart, and Hillbrandt) were lost. The remaining 89 of the ship’s company and ten prisoners (released from their cell at the last moment by William Moulter, a boatswain’s mate on the Pandora) assembled in four small launches, and sailed for Timor, in a voyage similar to that of Bligh. They arrived at Timor on 16 September 1791. After being repatriated to Britain, the ten surviving prisoners were tried by a naval court. During the trial, great importance was attached to which men had been seen to be holding weapons during the critical moments of the mutiny, since under the Articles of War, failure to act when able to prevent a mutiny was considered no different from being an active mutineer. In the judgment delivered on 18 September 1792, four men whom Bligh had designated as innocent were acquitted. Two were found guilty, but pardoned; one of these was Peter Heywood, who later rose to the rank of captain himself; the second was James Morrison, who also continued his naval career and died at sea. Another was reprieved due to a legal technicality and later also received a pardon. The other three men were convicted, and hanged aboard HMS Brunswick on 29 October 1792. In other trials, both Bligh and Edwards were court-martialed for the loss of their ships (an automatic proceeding under British naval law, and not indicative of any particular suspicion of guilt). Both were acquitted. Bligh resumed his naval career and went on to attain the rank of Vice Admiral. His career was marked by another insurrection. In 1808, while Bligh was Governor of New South Wales, troops of New South Wales arrested him in an incident known as the Rum Rebellion. This insurrection confirms many scholars’ belief that, in an era when tyrannical and cruel leaders were common and harsh punishments were normal, Bligh was a terrible commander. Immediately after setting sixteen men ashore in Tahiti in September 1789, Fletcher Christian, eight other crewmen, six Tahitian men, and 18 women, one with a baby, set sail in the Bounty hoping to elude the Royal Navy. According to a journal kept by Edward Young, one of the mutineers, all but three of the Tahitian women had been kidnapped when Christian set sail without warning them. Bounty passed through the Fiji and Cook Islands, but feared that they would be found there. Continuing their quest for a safe haven, on 15 January 1790, they rediscovered Pitcairn Island, which had been misplaced on the Royal Navy’s charts. After the decision was made to settle on Pitcairn, livestock and other provisions were removed from Bounty. To prevent the ship’s detection, and anyone’s possible escape, the ship was burned on 23 January 1790 in what is now called Bounty Bay. Some of the ship’s remains, such as her ballast stones, are still partially visible in its waters. Her rudder is displayed in the Fiji Museum in Suva. An anchor of Bounty was recovered by Luis Marden in Bounty Bay in 1957. 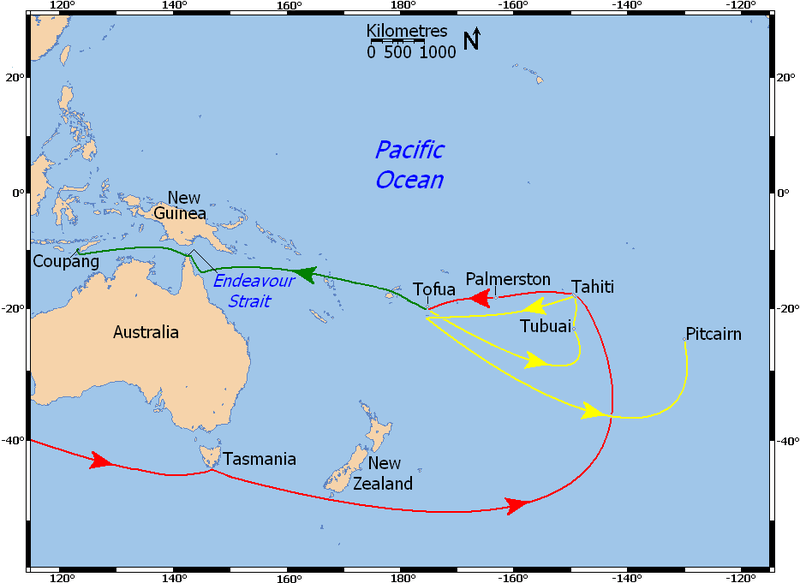 The map below shows the voyage of the Bounty under Bligh (in red), the voyage under Christian (in yellow), and Bligh’s course by launch to Timor (in green). The Pitcairn Island community began life with bright prospects. There was ample food, water, and land for everyone, and the climate was mild. Although many of the Polynesians were homesick, and the Britons knew they were marooned on Pitcairn forever, they settled into life on Pitcairn fairly quickly. A number of children were born. At the time the community on Pitcairn was first visited by outsiders, John Adams was the sole surviving mutineer. Little is agreed upon regarding Fletcher Christian’s role once the mutineers were established on Pitcairn Island. Adams claimed “Christian was always cheerful” but also claimed Christian would “retreat and brood [in a cave, and] had by many acts of cruelty and inhumanity, brought on himself the hatred and detestation of his companions.” Adams variously claimed that Christian had been killed “in a single massacre that occurred on the island about four years after arrival” and that Christian had committed suicide. Adams at another point claimed the “mutineers had divided into parties, seeking every opportunity on both sides to put each other to death.” While the details were inconsistent, Adams usually agreed with the journal of Young that Christian died as the result of a massacre: “The massacre … had taken place in several waves of violence, and principally arose from the fact that the Englishmen had come to regard their [Tahitian] friends as slaves.” The women, “passed around from one ‘husband’ to the other, as men died and the balance of power shifted,” eventually rebelled as well. Their descendents still live on Pitcairn, but some resettled to Norfolk Island off the east coast of Australia in 1856 when Pitcairn became too small for the growing population. What else could I recommend but breadfruit to commemorate this day? It is not easy to find fresh, but can be bought, in season, in Caribbean markets in Europe and North America. There are also websites that offer it frozen, such as http://www.sams24-7.com/foods/BREADFRUIT-FROZEN-12-OZ.aspx I did locate one site that offered fresh breadfruit, but it turned out to be a commercial site and I would have had to order several tons. I’ll admit it was cheap! There are many ways to cook breadfruit. In Sri Lanka, it is either cooked as a curry using coconut milk and spices, or plain boiled and served with a sambal of shaved coconut and hot peppers. Fritters of breadfruit are also a local delicacy of coastal Karnataka. 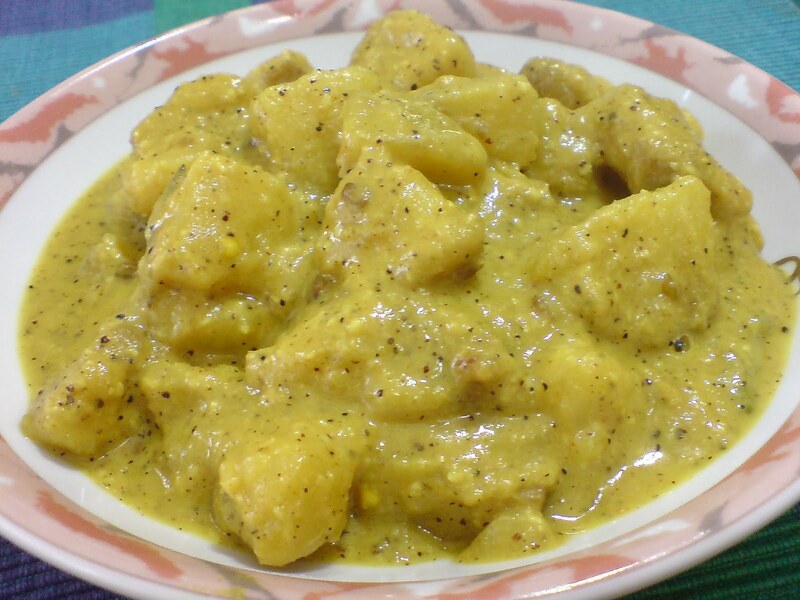 In Seychelles, it was traditionally eaten as a substitute for rice, as an accompaniment to the main dish. It would either be boiled (friyapen bwi) or grilled (friyapen griye), where it would be put whole in the wood fire used for cooking the main meal. It is also eaten as a dessert, called ladob friyapen, where it is boiled in coconut milk, sugar, vanilla, cinnamon and a pinch of salt. It is often said in Seychelles, that travelers who visit Seychelles will always come back if they eat breadfruit cooked in Seychelles. In Puerto Rico, it is traditionally eaten boiled with bacalao (salted codfish). It is also used to make rellenos de pana (mashed breadfruit filled with seasoned meat), mofongo, tostones de pana (double fried breadfruit), and even lasagna de pana (cooked mashed breadfruit layered with meat and topped with cheese). There is also a popular dessert made with sweet ripe breadfruit: flan de pana (breadfruit custard/flan). If you are curious, visit this site: http://www.ntbg.org/breadfruit/ It will tell you all that you need to know about breadfruit including a host of recipes, new and old. Pretty much any recipe for potatoes or sweet potatoes can be adapted for breadfruit. It is usually sold unripe or semi-ripe in markets outside the tropics, which must be cooked. Fully ripe breadfruit can be eaten raw. It has a taste reminiscent of freshly baked bread, hence the name. It is worth noting that while Bligh’s feat of sailing an open boat across the seas was unparalleled, by a curious accident of fate a group of escaped convicts from the settlement at Botany Bay (aka Sydney) set off in an open boat up to Timor a similar distance. There, once their status as escaped transportees was discovered, they were taken in chains with those returning from the ill-fated attempt by HMS Pandora to return the Bounty mutineers. The escaped convicts mostly died, but the case of one Mary Bryant attained public prominence and, with the aide of James Boswell, she was pardoned, and returned to live in Fowey, Cornwall.